Updated 10/25/18; Originally posted July 2018. Janine Hasey, UCCE Tree Crops Advisor Sutter/ Yuba/ Colusa Counties; Bruce Lampinen, UCCE Walnut Specialist, UC Davis; Katherine Jarvis-Shean, UCCE Orchard Advisor Sacramento, Solano & Yolo Cos. Early walnut tree training begins at the time of planting either a rootstock or a “finished tree” (grafted or budded with the English variety) through the “first leaf” (first growing season of English scion in the orchard). Traditionally, the nursery products available were bare root rootstock that was subsequently field grafted or finished bare root trees. A decade ago, clonal Paradox production introduced the option of planting a potted (container) tree. UC also began researching leaving finished trees unheaded (or high headed) to increase early yields. With more choices comes more complexity of how to develop rootstock growth, when to bud or graft and how to train English scion growth. 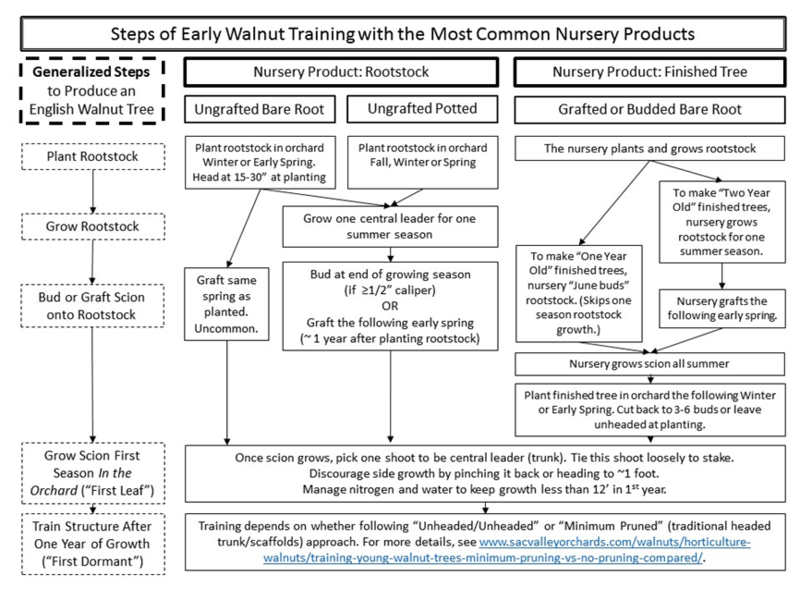 In this article, we discuss the various walnut nursery products available and training practices through the first leaf growing season. For information on the subsequent first through fifth dormant training of the English scions see this article. Each type of nursery product requires different initial handling, but ultimately they all lead to a productive orchard. It boils down to economics, tree availability, and grower preference. The main factors to consider include time required to bring the orchard into bearing, labor availability, cultural management, and the cost of various nursery products. 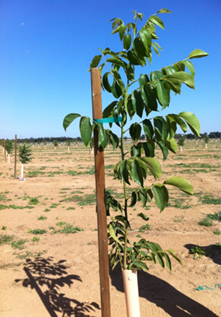 Walnut nurseries provide rootstocks that are then field budded or grafted, or finished trees that were June budded or nursery grafted. Seedling rootstocks (Paradox or black), or clonal Paradox rootstocks (RX1, VX211, or Vlach) are sold as bare root rootstock or as bare root budded or grafted finished trees. Clonal rootstock trees may also be sold as potted rootstock that is fall budded or spring grafted in the field. Some nurseries produce clonal own-rooted English trees for specialized situations such as where walnut blackline disease is prevalent. With good irrigation management, young walnut trees can grow very quickly. Walk through new orchards regularly to ensure proper training. 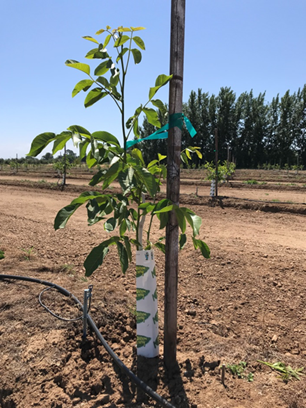 Visit the walnut section of this site for more in-depth information on rootstock selection, planting and irrigating bare root and potted rootstock. At planting, cut back to between 15-30 inches in height. Leave larger caliper trees on higher side, smaller caliper trees on shorter side. 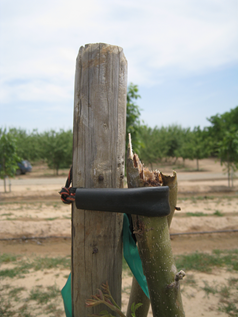 Rootstocks can either be grafted in spring after planting, fall budded, or grafted the following spring. If waiting until fall or the following spring, train one dominate rootstock shoot through the summer by pinching back less vigorous shoots. For fall budding, a minimum of ½ inch diameter wood is needed. Otherwise, plan to whip graft the next spring. Once successfully grafted or budded to the English variety, encourage a single leader (the trunk) by keeping side shoots pinched or cut back to about a foot. Tie the leader loosely to the stake through the summer (photo 1). This developing trunk must be allowed to move freely in the wind; if tied too tightly there is no flexing during windy weather resulting in a weak trunk prone to breaking near the top of stake (photo 2). Avoid pushing more than twelve feet of growth for first leaf trees. Even if the trunk is taller than you want during the summer, do not tip or head the trunk to slow growth because it forces next year’s primary buds to break (photo 3). 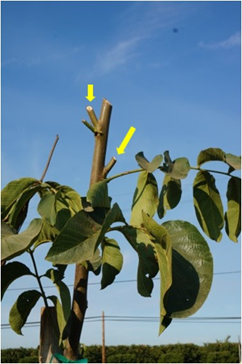 The weak limbs produced by tipping or heading the trunk must be removed at the first dormant pruning (Photo 4). Planting bare root rootstock and fall budding or grafting the following spring adds an additional year in the training process, compared with finished trees. Once potted trees are planted either in early fall, the dormant period, or as actively growing plants in the late spring, train as in third and fourth bullet above. Clonal rootstocks are inherently vigorous, so pay attention where growth is excessive. Avoid pushing growth by over irrigating or fertilizing. Consider that nitrogen may not be needed the first season when growing the rootstock or the following summer when training the English trunk (first leaf). Monitor soil moisture or use stem water potential to avoid over or under irrigation, keeping trees growing at a reasonable pace. Planting potted rootstock and fall budding or grafting the following spring adds an additional year in the training process, compared with finished trees. At planting, cut back to 3-6 good buds above the graft or bud union. During the 1st leaf English scion growing season, select the strongest shoot which is current season growth (neoformed) and train as the trunk (photo 5). Keep side shoots pinched or cut back to about a foot. Tie the leader loosely to the stake through the summer (photo 1, above). This developing trunk must be allowed to move freely in the wind; if tied too tightly, there is no flexing during windy weather resulting in a weak trunk prone to breaking near the top of stake (photo 2, above). Avoid pushing more than twelve feet of trunk growth. To slow trunk growth where excessive, allow side shoots to grow longer during the summer and see second bullet above to make sure not to over-fertilize. Even if the trunk is taller than you want during the summer, do not tip or head the trunk to slow growth because it forces next year’s primary buds to break. The weak limbs produced by tipping or heading the trunk must be removed at the first dormant pruning. 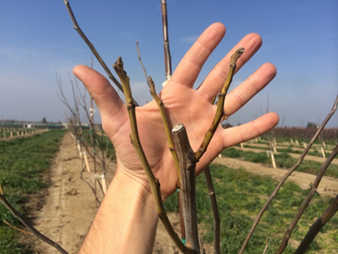 Research conducted at UC Davis and in grower orchards has shown trees that are left unheaded after planting grow as well or better than those that are cut back to 3-6 buds. The trees left unheaded grow more slowly initially resulting in fewer problems with bending in the wind. More recently, research has shown tall finished walnut trees can be left unheaded or high headed and will grow very well. With this training method, primary scaffolds can be produced during the first leaf growing season in the orchard from preformed buds (that grew while in nursery); these are typically removed by heading at planting in the traditional method. Primary scaffolds formed during the first leaf growing season and high yields were produced in the third leaf on tall, unheaded June budded trees in a Sutter County study. These trees were not headed in the nursery or at planting, and scaffolds were not headed for the first through third dormant training (other than removing broken and some lower limbs). Likewise, high headed 2 year-old nursery grafted trees were able to achieve primaries the first year in a demonstration study. This method of high or no heading tall trees at planting, which produces primary scaffolds during the first leaf growing season looks promising, allowing earlier tree development and earlier returns. The availability of tall June budded trees may be limited at the present time. Some nurseries are beginning to sell clonal Paradox rootstock grafted in a pot (container). These trees have very limited and sporadic availability. They are planted in late winter/early spring. The trunk is trained during the first growing season in the orchard.